The weather is warming up and the days are getting longer – springtime is in full motion and soon summer will be upon us. Time is flying by with the seasons and we need to treasure every moment, seizing the day, and grill grill grill! 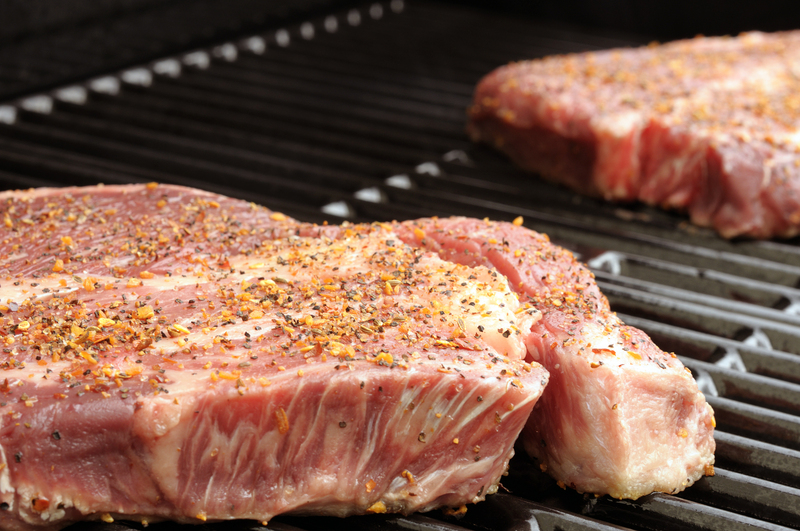 Continuing our Grillin’ in the Spring series, we bring Peppered Ribeye Steaks. Ribeyes are my favorite steaks, and the combination of lemon pepper, black pepper, and crushed red pepper, crusted over carmelized fat and meat makes these the perfect choice for a Mother’s Day or weekend BBQ. To start, you need four beef ribeye steaks about 1½ inches thick. Make a rub of garlic powder, paprika, thyme, oregano, black pepper, lemon pepper, crushed red pepper flakes, salt, and olive oil, and rub over both sides of each steak. Cover and chill for an hour allowing the seasoning to penetrate and soften the tissue. Grill over medium heat for 7-8 minutes, then remove from grill and allow to rest for 5-10 minutes before serving. Super simple and wonderful, each bite will produce thankfulness and contentment for a life well-lived and beef well-grilled. So fire up the grill, grab your favorite drink, and join the throngs of barbeque lover’s ‘round the world Grillin’ in the Spring! Brush steaks lightly with oil. In a small bowl, combine all seasonings. Sprinkle seasonings over steaks and press into both sides. Cover and chill for 1 hour. Grill over medium heat or broil 4 in. from the heat for 7-8 minutes on each side or until meat reaches desired doneness (for medium-rare, a thermometer should read 145°; medium, 160°; well-done, 170°). Let stand 5 minutes before slicing. Place on a warm serving platter; cut across the grain into thick slices.